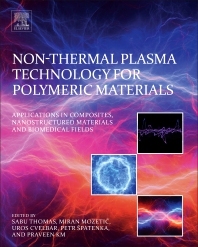 Non-Thermal Plasma Technology for Polymeric Materials: Applications in Composites, Nanostructured Materials and Biomedical Fields provides both an introduction and practical guide to plasma synthesis, modification and processing of polymers, their composites, nancomposites, blends, IPNs and gels. It examines the current state-of-the-art and new challenges in the field, including the use of plasma treatment to enhance adhesion, characterization techniques, and the environmental aspects of the process. Particular attention is paid to the effects on the final properties of composites and the characterization of fiber/polymer surface interactions. This book helps demystify the process of plasma polymerization, providing a thorough grounding in the fundamentals of plasma technology as they relate to polymers. It is ideal for materials scientists, polymer chemists, and engineers, acting as a guide to further research into new applications of this technology in the real world. Professor Sabu Thomas is Professor of Polymer Science & Technology and Honorary Director of the International and Inter University Center for Nanoscience and Nanotechnology, at the School of Chemical Sciences, Mahatma Gandhi University, India. He is a prolific researcher, with 420 international papers, 6122 total citations, 2 patents, 18 books and a total of over 625 publications to his name, and is listed as one of the most productive researchers in India by the Council of Scientific and Industrial Research. Prof. Thomas is a recognized authority in the field of polymer-based materials, and established the state-of-the-art lab in polymer science and nanotechnology at Mahatma Gandhi University. He has been a visiting professor at many polymer research laboratories in Europe and Asia. Uros Cvelbar is Senior Research Scientist and Deputy Head of the Department of Surface Engineering and Optoelectronics at the Jozef Stefan Institute, Ljubljana, Slovenia. He also works part-time as professor and teaches mostly postgraduate courses in Ljubljana, and some other European Universities like the University of Barcelona, Tomas Bata University, and others. Petr Špatenka is Head of the Department of Materials Engneering at the Czech Technical University in Prague. He is also Director of the Department of Applied Physics and Technoloy at the University of South Bohemia in České Budějovice, and Co-owner of SufaceTreat, a company focused on plasma technology.